Ski/board right to your back door! Enjoy a beautifully furnished large open living space with cathedral ceiling and cathedral windows with sunset views. Keep warm by the fireplace (wood included) and take advantage of the fully equipped kitchen. Enjoy 2 large bedrooms, each with a full private bath. Master bedroom includes a jacuzzi tub. Pet Policy: Dogs will be considered. Please ask about your dog in your inquiry. There is a $20/night dog fee. Enjoy beautiful mountain views from your front deck! Nothing better then coming home for lunch. Or skiing home in the evening while the sun sets in front of you, magical! Our condo is a very easy ski in and out! Right out your back door, no parking lots to cross. Ski right down to the Timberline Quad and enjoy your day! Pool, hot tub and fitness available at sports center for an extra charge. High speed internet available at no extra charge. This condo allowed us a wonderful ski vacation! We are a family of four, and it provided more than ample space for us to enjoy fireside time together upstairs in the large living room and open kitchen, as well as enjoy privacy downstairs in the two bedrooms. The condo hosts a bathroom off of each bedroom as well as s half bath upstairs, which is great. The only issue we could have had was that it was not ski in/out because of the incredible amounts of snow accumulated out back (which hardly seems like a fair complaint!) and because the lower/Timberllime lift wasn’t always running due to wind. The condo itself could use a little TLC, but it is indeed a ski condo and perfect for that purpose. The people who work here are super friendly and helpful. Even the resort owner came to chat with us at lunchtime in the lodge! We enjoyed delicious food on the mountain, and had everything we needed to enjoy family meals at home as well. Aside from the excellent skiing, we hope to return to watch the amazing sunsets from the cozy and beautiful front deck, which we also enjoyed thoroughly. Great condo and great mountain! We stayed here over MLK weekend. Condo is great and had everything one would need for a great ski week/weekend. We will definitely come back. We enjoyed staying at this condo. We bring our dog on vacation and this was the perfect spot to ski off and check on her. The Condo was great. It is a little dated and worn, but good for an active family with a pet. Loved the fireplace and plenty of wood. Our only issue is if you go there and it's icey, you need 4 wheel drive. We did not have 4 wheel drive and left early due to weather and getting out down the hill. The ski on and off is only if a certain lift is open. For us it opened that day but day 3 was not open due to weather. (icey/wet). So you would have to drive (short) to the base lodge (there was no public shuttle) Overall we enjoyed our stay and I do recommend if you want a casual condo and good location. Having never heard of Bolton Valley we were not sure what to expect. It is not a "resort" experience but an awesome local mountain with fantastic terrain. We had both Green/blue skiers as well as more advanced skiers and this had something for everyone. Our family LOVED the glade skiing - some of the best we have ever experienced (partially thanks to the several feet of snow we had while there!) Lift tickets were also relatively inexpensive compared to other mountains and despite a holiday weekend, lift lines were almost non-existent. The condo we stayed in was perfect for our two families of 4. We each had a bedroom with its own private bath. We stayed in the guest room with the bunkbed and the other family had the master and used the aerobed for their two kids. The upstairs loft area was spacious and comfortable. The ski-in/out was super convenient and we were fortunate that Timberline lift was running the entirety of our stay. If not, it would have just been a very short drive up the hill to the main lift. We also enjoyed spending a day on the nordic trails cross country skiing. Ann-Marie and Scott were super communicative and helpful in the process. Highly recommend giving Bolton a try and staying here. We will most likely be back! We are so glad you enjoyed your stay! We love Bolton too and you pointed out all the reasons why. We would love to have you back again sometime! 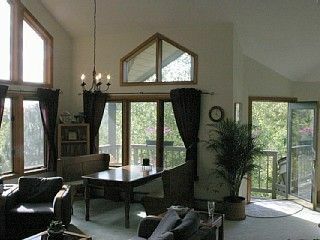 The townhouse is located at Bear Run at Bolton Valley Ski Resort. Bear Run is considered the luxury townhomes of the resort. Bolton Valley is a friendly family oriented ski area. The resort is the only Vermont ski area to have a base side village. The village includes Bailey's Restaurant, the Fireside Flatbeard, the deli and the James Moore Tavern which is full of night life! The Sports Center houses the pool, hot tub, arcade, fitness center, and more. Winter activities include skiing and snowboarding, night skiing, extensive cross country skiing and snowshoeing. Rentals available. Regular Season $295/night, $1850/week Discounted Weeks April - Dec 14, $260 nightly, $1300/weekly. THIRD NIGHT IS HALF PRICE!! Regular Season Jan 3 - Feb 12 & Mar 1 - April 1. $295/nightly, $1850/weekly. 2 night minimum. Holiday Season Feb 13 - Feb 29. $325/nightly, $1980/weekly. 4 night minimum.